It is unbelievable, that whole day, when you consider what could have gone in a different way. But luck and a lot of other things were on my side this day. Standing on top of the ramp before my last jump and hearing the 15000 spectators singing happy birthday for me was great. Landing my last trick in front of them even better!! Already at the very beginning of the season I was able to land my best ever 1080. Which brought me a very unexpected win at the freestyle.ch, Europe’s biggest fun sport event. Riding a great final against Peetu Piroinen, Scotty Lago and Hampus Mosseson. Maybe more unexpected to a lot of people in the snowboard scene. 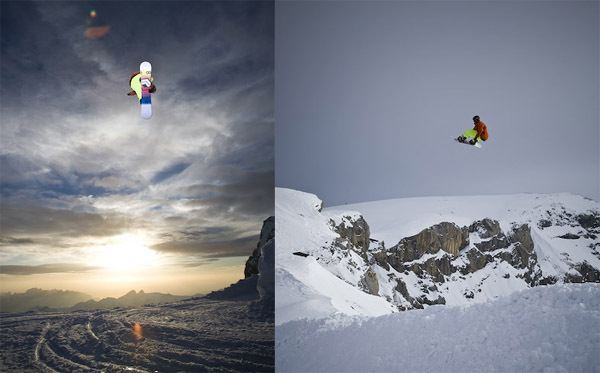 Since they didn’t really follow my FIS big air accomplishments, the win at freestyle.ch. came a bit out of the blue for them. I was stoked to cause a bit of surprise and wonder there. I also got so many props from other riders for my performance there. My pre season training and preparation went well. I put a lot of effort into going to the glaciers in early September. Saas Fee and Hintertuxer glacier mostly. And it paid off. 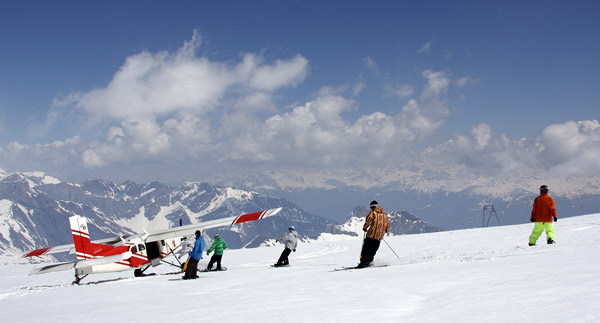 Also most of October I spent riding on the Hintertux glacier. 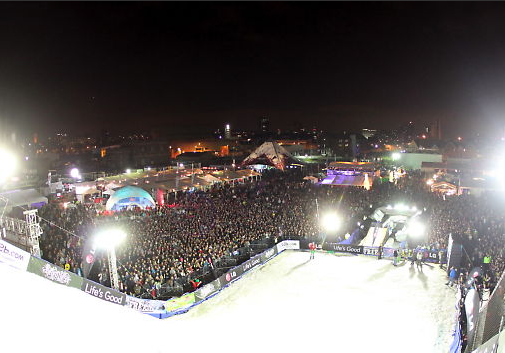 In London at the first stop of the FIS big air tour I had a good start as well. I finished 2nd place behind Peetu (Piroinen). At the Pleasure jam (a TTR event) on the Dachstein glacier I rode well and was leading after the qualifiers, but couldn’t land all my tricks in the finals. Nevertheless I probably had my best feeling for kicker riding ever. As a result of riding a lot in good conditions (nice weather, no wind and great shaped kickers and softer snow) and my motivation being higher than ever. I guess I just had so much fun riding jumps and every time I got better I could enjoy it more and more. Unfortunately I bruised my knee at the big air in Stockholm. A super flat landing made it impossible to stay really safe there. But still I managed to ride the finals and ended up 4th, and to keep me in the race for the FIS world cup. That injury followed me a long time throughout the season. With breaks and therapies I mostly managed to be fit for the competitions. So after Stockholm I couldn’t ride for 2 weeks and the next time I strapped on a snowboard again was at the next stop for the FIS tour in Grenoble. Luckily the conditions were favourable for my knee. It was warm and the snow was soft, giving my knee a little bit of dampening. I rode very well there. 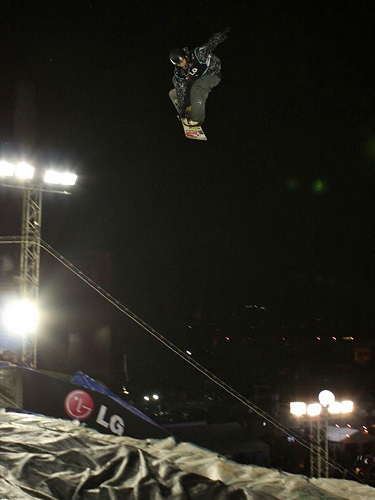 A perfect frontside 1080 in my second final jump put me in the lead. Mattieu Crepel did the same and was just a tad behind me. He pulled of a great last jump and won very tight ahead of me. That second place also put me in first place on the big air tour. During the Christmas holidays I was riding and training in my home resort. A good possibility to ride and get some tricks dialled in but I always had my knee injury in the back of my mind. riding at home in Leogang. I had my almost private kicker! Not 100 percent fit I went to the O’Neill evolution in Davos. The on site physiotherapist improved my knee and I was pretty happy with my 10th place and my riding there. 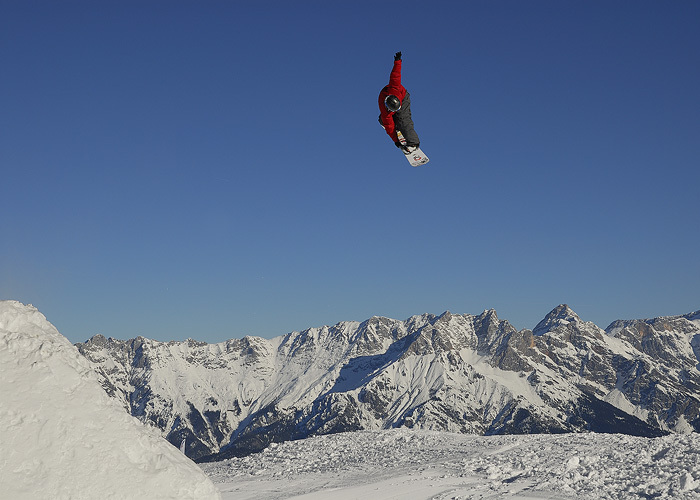 Also my performance at the European Open in Laax was quite good. Not surprisingly I wasn’t able to get some good tricks on the jib section. Riding a lot and especially riding on those icy slopestyle courses forced me again to make a break and rest my knee. 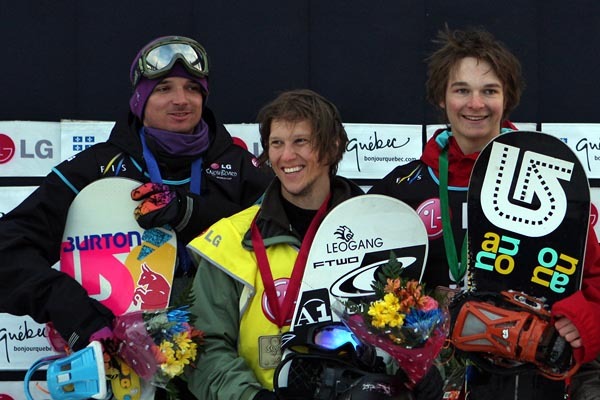 A week later I got 3rd at the FIS world championships in South Korea. Definitely one of my biggest success throughout my whole carrier. A lot of media attention and pressure combined with a world-class field of riders keen on one of the top 3 spots made this event a special achievement for me. Once again my ability to jump a bit higher helped me to secure a medal there. Some luck was part of it as well for sure. After physiotherapy and a few days off I moved on to the next stop of the FIS world cup. Quebec, Canada. A unique event site in the middle of two highways was waiting for us. Due to my injury I wasn’t able to practise at all but the conditions in Quebec were favourable for me. A step takeoff called for technically clean riding and fast legs. I showed a few good tricks and could claim my first victory on the FIS tour this season. 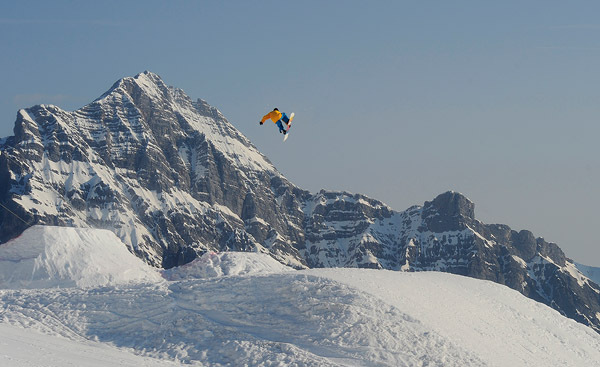 That win also secured the first place in the big air world cup. With only one event left I had enough margin to win the tour this season once more. So at the final event in Moscow, Russia I tried to ride without pressure. But it never happened, still I was nervous like 10 years ago as a newcomer. An icy ramp but really well shaped jump in front off the national university, with a big crowd and very strong winds made it not easy for us riders. My tactics of staying safe and throwing down two nines were not mind-blowing but successful on that evening. I won the last event of the tour in front of Marco Grilic, who double back flipped through the storm onto the ice. Finally I rode some powder at home, giving my knee a little softer surface to land on. Later in March I did the Aesthetiker team event in Mayrhofen, Austria. This was a very easy contest format. Riding and fun was definitely the main issue there. Nevertheless they had the best park I ever rode. Our team got second. The rest of the season I rode some more fresh snow around Austria. I was working on various little things on my snowboarding technic. And I rode a lot at my local kicker in Leogang. Now that the season is over I am working on my physical health again. I am doing all kinds off therapies for my knee, which is already feeling great. But a little rest and time for recovery will be good for my body and next season I can only benefit from it. Looking at my competition results this was most likely my best season ever. 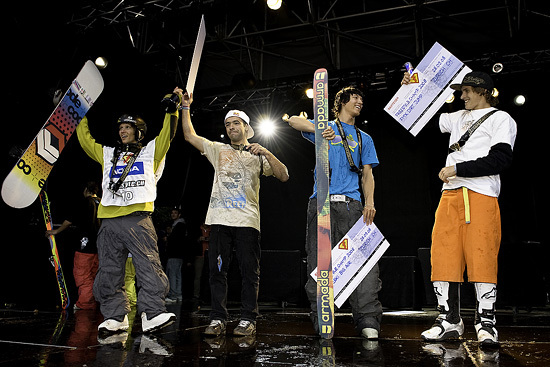 Getting a medal at the world championships, winning the FIS big air tour once more and my great win at the freestyle.ch made this a very successful winter. 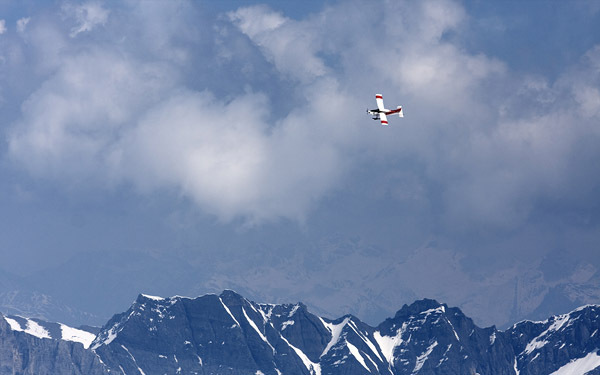 When the ski resort was already closed in Les Diablorets, Switzerland we had the chance to fly up to the glacier with a small airplane and ride the jumps up there just by our selfs. O'Neill organized the whole thing for us (the team). The jump was really good and it was such a relaxed atmosphere to ride the whole day into the evening sun. 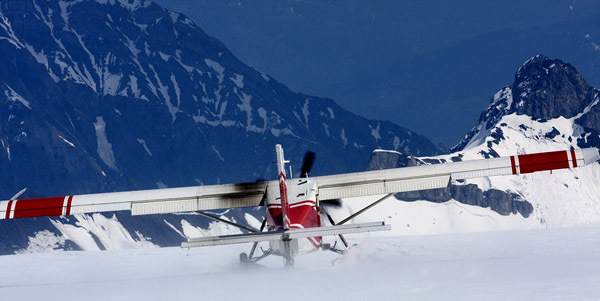 After a bumpy flight we landed on the snow. 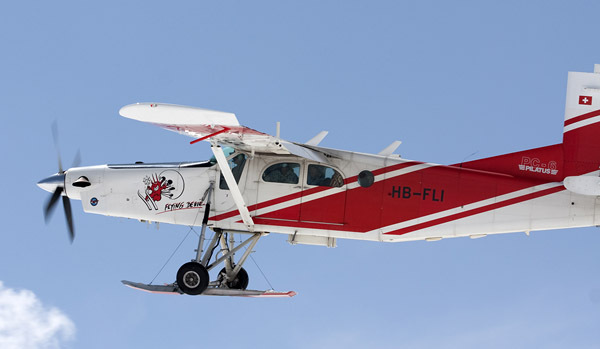 The plane had skis to make it possible. But still it was scary. Snowboarding the jumps was definitely safer that day! Flying Devil was the name of the plane. quite a different boarding procedure.